What could possibly make the humble butcher’s paper and paint easel seem old school? An iPad easel, that’s what! I tell you, I never cease to be amazed with just what iPad accessories are coming around the corner, but an iPad easel, well that took me by surprise! 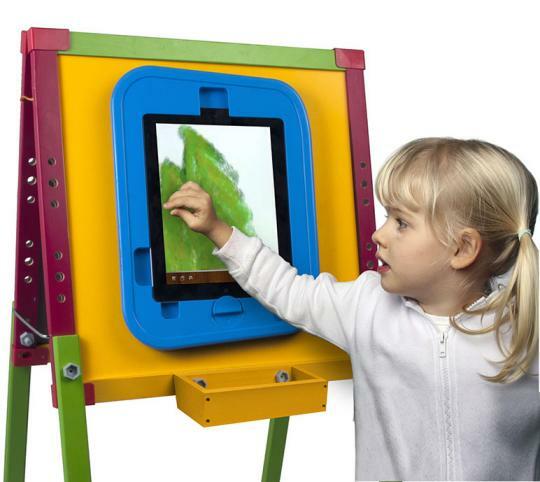 From the makers of the iPotty, the CTA Digital Kids Drawing Easel For iPad takes drawing to that next level, with the use of downloaded drawing apps and a crayon-like stylus that comes with the easel. A 360° rotating iPad case does a fantastic job of keeping your iPad out of harm’s way. Now before you think that the Kids Drawing Easel For iPad does nothing more than house an iPad, it does have a whiteboard side for drawing the good old fashioned way so children can reap the rewards of of both traditional and technical drawing worlds! As far as we can tell, The Kids Drawing Easel For iPad isn’t available in Australia, but is priced US$33 and available at major US retailers, as seen on the CTA Digital stockists page.